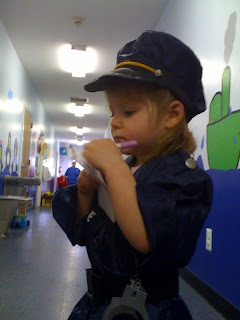 A Future in Law Enforcement? Evie, an in utero stroke survivor with right-side weakness, has been working on her dressing skills with her occupational therapist for several weeks. Just yesterday morning, she pushed her right arm and hand through the sleeve of her long-sleeved shirt without instruction or assistance! Although this may seem like a small achievement, it is evidence of her ever increasing use of her affected side. She is well on her way to doing great things... maybe even in law enforcement! Watch out speeders! Something very special happened this summer at the Children's Hemiplegia and Stroke Association (CHASA) Family Retreat. Teens and young adults from all over the world came together to share information with the families of younger children who have hemiplegia. The common factor that brings these young people together is that they have a diagnosis of hemiplegia or hemiparesis (weakness or paralysis on one side of the body). Some have hemiplegia due to an early stroke; others due to surgery for epilepsy or other causes. They talked and laughed about the different ways they've found to adapt to life with the use of one hand. They shared information about living on their own, adapting a car, and managing epilepsy. I don't know if there was a dry eye in the room as we listened to these accomplished young people interact with the parents of younger children. While they face many struggles, it seems that these struggles have given them strength, empathy, and a great deal of wisdom at such an early age. I look forward to hearing from them every year at the annual CHASA retreat and learning more about their adventures as they enter college, jobs, and start their families. I feel very honored to know every single one of these young people. I am quite new to the Hemi-Kids discussion list and I would like to share my daughter's story with you. I would just like to say how amazing joining Hemi-Kids has been. It has been a huge support to me and the parents have given me some fantastic advice. It has really made a difference in my life. My daughter, Layni May, is 11 months old and a very cheeky little monkey! She suffered a stroke at birth and as a result has right sided hemiplegia. The news was upsetting and with Layni being born only 11 months after her brother I knew the future was going to be challenging! Layni began having visits from the Physio therapist and Occupational therapist from 4 weeks old. She uses her right hand as a support hand really well and quite often looks at it in amazement, as if it’s a new toy she hasn’t seen before. She can sit unaided and is beginning to lean on her left arm and reach for toys. She is very determined and is desperate to follow and play with her older brother and sister around (being a third child has it’s advantages!). I truly believe that things happen for a reason. This will not only make Layni a stronger person but it has already bought our family closer together. Spending time in the NICU has made me learn that I cannot take my children for granted and to love, enjoy and cherish all my time with them. I have no doubt that she will achieve whatever she sets her mind to and she will overcome the obstacles in her life in one way or another! I am so proud of her and my family.